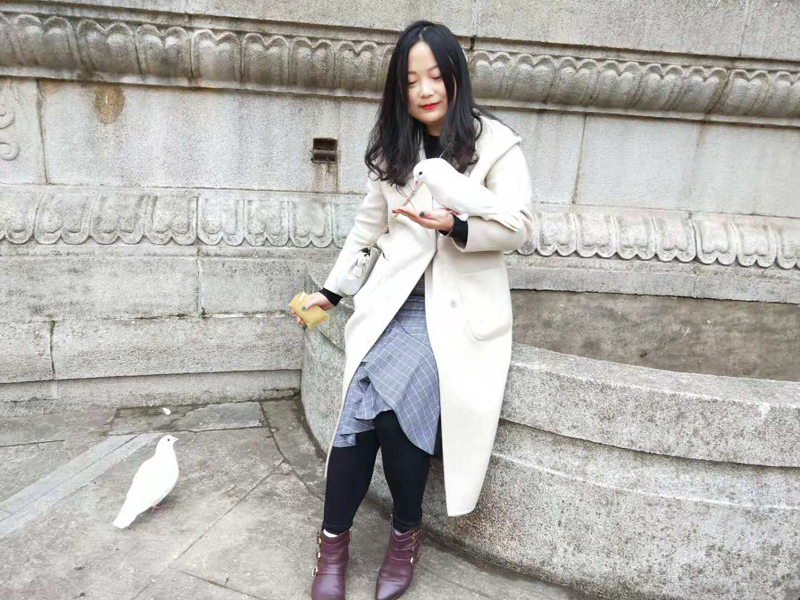 In my last Spring Festival Holiday, I had a wonderful tour to Nanjing and Yangzhou with my dear sister. 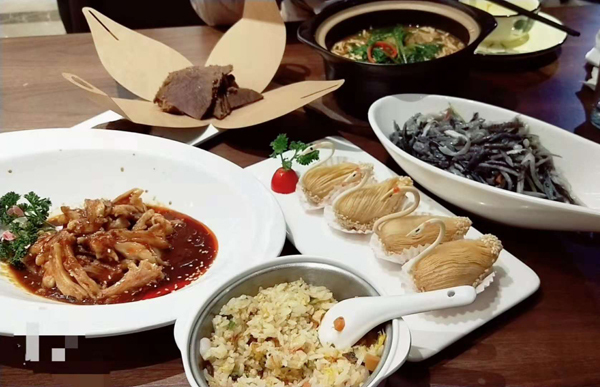 After the reunion meal with families on 13rd Feburary, 2018, we began our tour on the next day. This 5 days’ journey is quite memorable and meaningful for us. It was the last day of Chinese Lunar Year. We met few people along the way from Chengdu to Nanjing. Most had chosen to return to home, while some just like us started their tour earlier to avoid crowds in festival. We arrived in Nanjing at about noon and chose East Zhonghua Gate Historical Culture Block as our first stop. Old buildings were preserved well and used as a library, theater and photo studio. 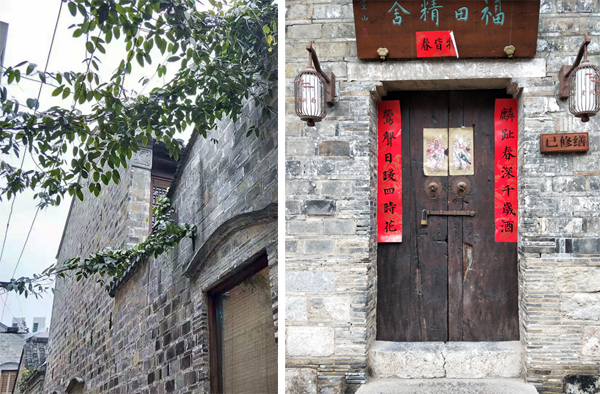 Some old houses are closed, on whose doorplate wrotes that restoration has completed. I was glad that they remained the old appearance and would be granted new mission one day. We wandered about freely in alleys and sometimes I just thought I returned to old times. 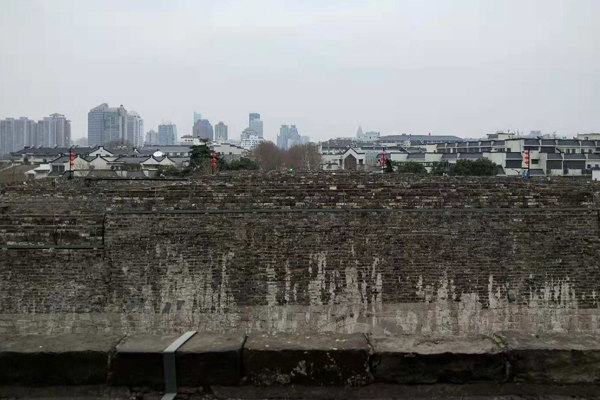 Wandering along the City Wall, we came to Zhonghua Gate, the south gate of Nanjing City. It is the biggest castle-style city gate in China and the most complicated castle in the world. 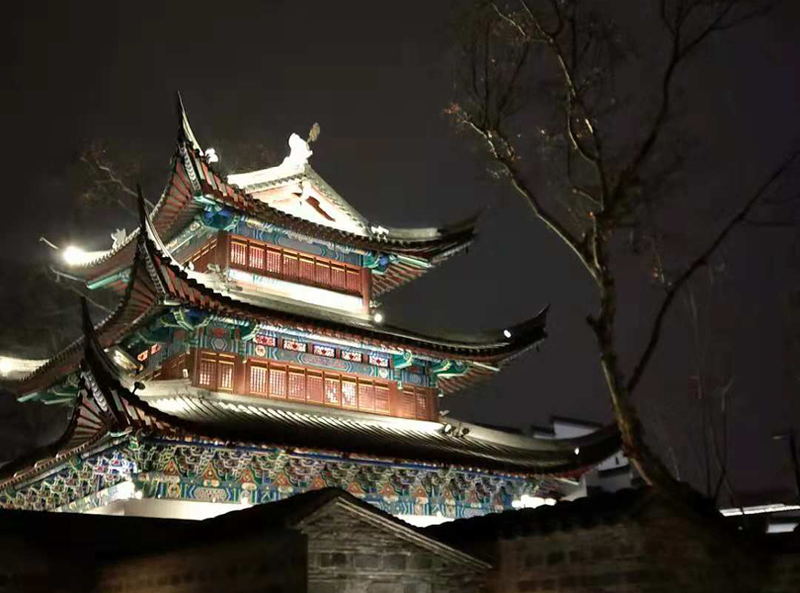 Built from 1366 to 1387, Zhonghua Gate boasts great skill, delicate structure and magnificent scale. It is said that 27 tunnels were built in the castle to store large quantities of food, weapons, and approximately 3 000 soldiers. But we only found several large tunnels. 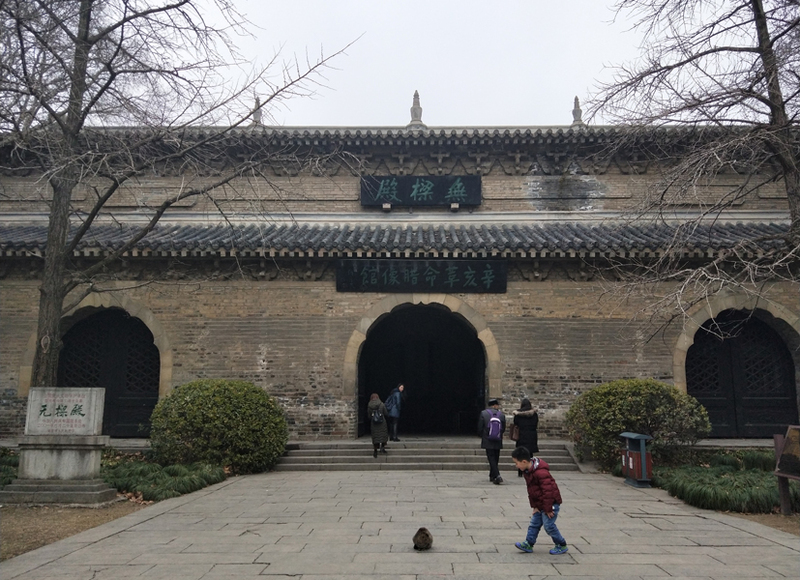 Jiangnan Examination Hall (Jiangnan Gongyuan), I assume, was the most interesting area for my young sister that day. There was no much to see about the site itself but the museum included in entrance fee was beyond our expectation. It is an underground museum and one needs to walk along a sideway down to the bottom to start his visiting. One side is rolls of bamboo slip. 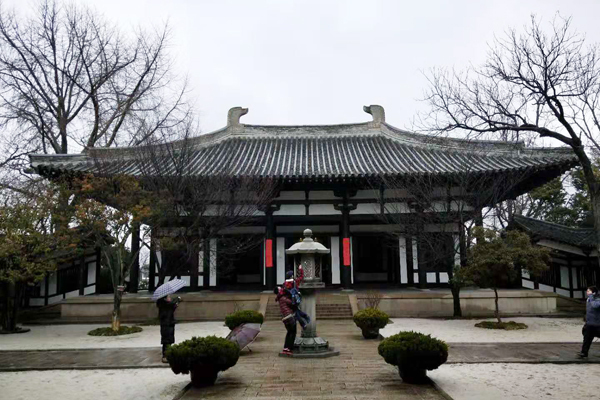 Within the building, tourists learn history of imperial examination system while they go up one floor to another floor. We spent the whole day in the Zhongshan Mountain Scenic Area. 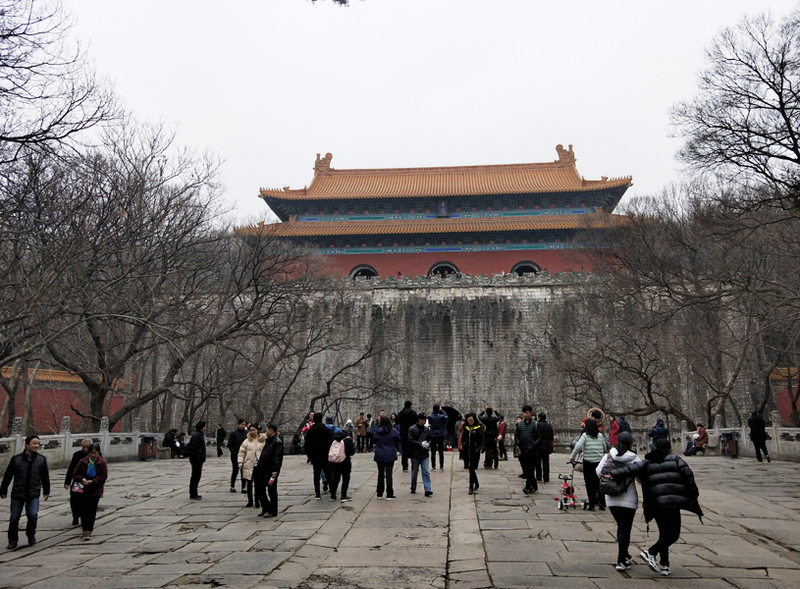 We visited Meiling Palace, Ming Xiaoling Mausoleum, Linggu Temple, Dr. Sun Yat-sen’s Mausoleum. It is quite large and eco-car helped our visiting. 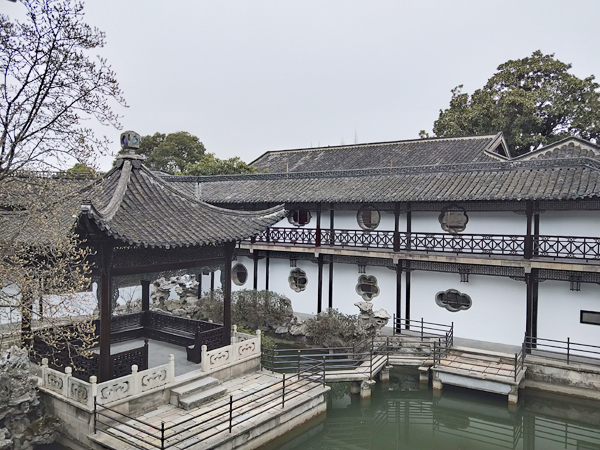 Meling Palace is delicate and famous for its aerial view in autumn. The zigzag path is planted with yellow cotonier, just like the chain of neck lace. In the center is the delicate palace with green roof, just like a diamond. Ming Xiaoling Mausoleum is indeed in a magnificent scale. The first emperor of the Ming Dynasty(1368一1644)and Queen Ma are buried there. There is not much to see about tomb itself. I preferred to the ruins along the way. Most wood construction was destroyed and only stones left. One felt nothing but relentless evolution of time, which perfectly matched the tomb. Along the Sacred Way is Meihua Mountain. It was a great pity that few plum flowers blossomed in our visiting. Dr. Sun Yat-sen’s Mausoleum was a short stop. We climbed on and pay a visit to the historic giant, who led Chinese to end feudal monarchy system and start a new age. Compared with these large sites, my sister and I had a more relaxing time in Sun Yat-sen Mausoleum Music Stage and Linggu Temple Area. We fed pigeons at Music Stage and came across with a boy and a homeless cat. I personally thought it would be quite relaxing to take a walk there to admire beautiful flowers in spring and dyed trees in autumn. It was still a nice travelling experience though we were not in right time. 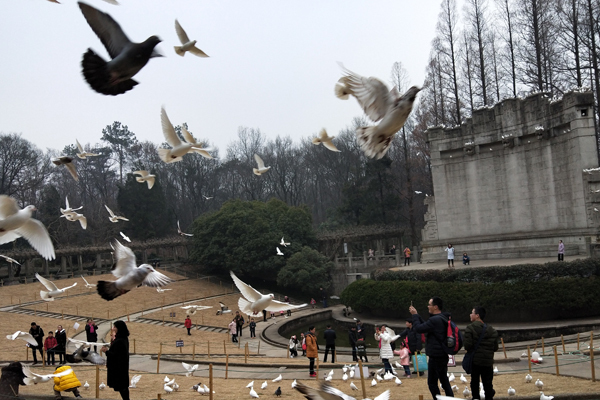 I am quite jealous that Nanjing people have such a place endowed with rich history and natural beauty. More importantly it can be reached with easy transportation. This morning was quite busy for we had to make a visit to three areas–Nanjing Presidential Palace, Librairie Avant-garde and Jiming Temple. We discussed yesterday but did not want to give up any of them. Afterwards it proved it was worthy. The first stop is Nanjing Presidential Palace. It was one of most expected sites. I was advised to make this visit by my father, but it is most crowded site and a failure in the whole journey. Our most time was spent on wandering in his garden, while main building was filled with people. So we quickly finished the trip. The best way to avoid crowds jumping into your photo is to holding your phone higher. Our next stop is Librairie Avant-garde. My younger sister often went to libraries. Nanjing was her heaven because almost in every tourist site one could find a library. Librairie Avant-garde is built in an underground garage. I bought a hat there and it perfectly fitted me. My problem was solved. The final stop is Jiming Temple, which is the No. 1 of the four hundred and eighty temples built in Southern Dynastey. We both found our amusement. I was impressed by drinks and snacks in front of Temple. Nuns pick leaves and make fruit tea to sell. It was delicious with real tea smell and juicy fruit flesh. For my sister, she went there for Pharmacist Stupa, which appeared in her favorite game King of Glory. Scene about Leifeng Pagoda in Legend of White Snake is filmed in Pharmacist Stupa. It is said that wishing for a happy marriage here is quite efficacious. Generally speaking this busy morning did not disappoint us. Our Nanjing tour had finished. This was a city with lots of sites worth visiting. What we sought for was just a very small part. I was very satisfied with these unexpected pleasures, as I actually did not expect too much on the city. 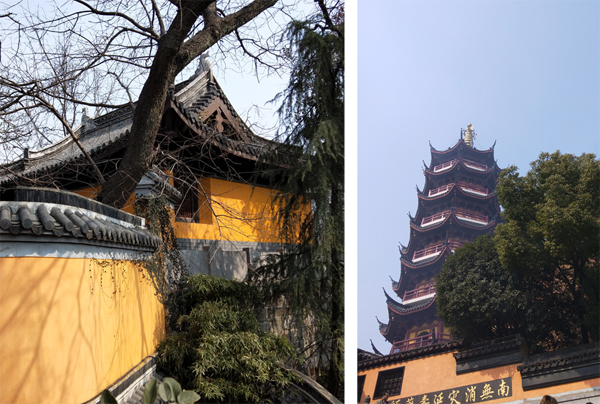 This afternoon we took a high speed train to Yangzhou, a small but historic city I longed for visiting. In this afternoon I did not arrange any sightseeing and the only thing to expect was to taste local delicious food. A wander was followed after the hearty dinner. On the old and narrow street was lined with small and low houses. On the rolling doors of shops was painted life scene in old times. Next day when we took a taxi, the local man told me it once was the center of city. It was a rainy day but did not stop my interest to visit He Garden. I always expected to go there because one of my favorite series was filmed there. Every scene reminded me of the characters in the story. Those men were brave and honesty. Everyone had a happy ending and found their true love. This visit to the house was my goal for the whole tour. This afternoon was a trip to Slender West Lake. In my opinion it was better to call it a park. It was raining hard and we bought an umbrella. 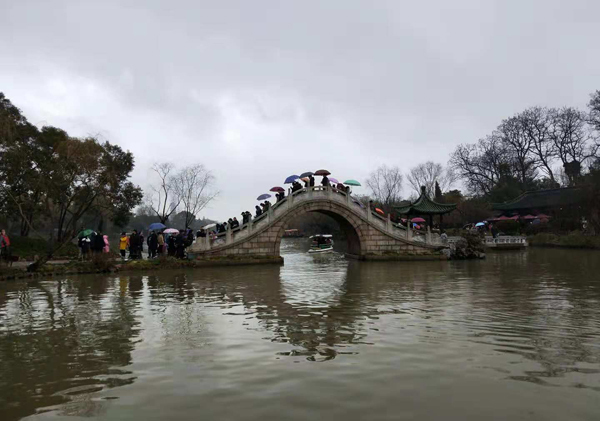 Though the rainy day made some trouble, it indeed decreased some tourists. Additionally the rain added some charm to the place. Crowds and bustle was kind of hidden beneath the rain. Caught in rain the line advanced cautiously. Suddenly wind got strong almost blew the umbrella, which made some hurried their pace towards shelter from the rain. In the Area, two most famous bridges are the Lotus Bridge and Twenty-Four Bridge. The first one is renowned for its delicate design. It is said that each of 15 openings has one moon reflection in full moon night. The second is famous for the poem—“When moon shines on the Twenty-Four Bridge bright. Where are you teaching flute-blowing tonight?” The bridge itself was kind of small and narrow in holiday. But I admitted that it was beautiful when I saw him from afar. Umbrellas in different colors were blossoming along the bridge. Evening arrived. I missed my sister and went back to find her. But we were lucky to see this area in night. It was the last day of our tour. 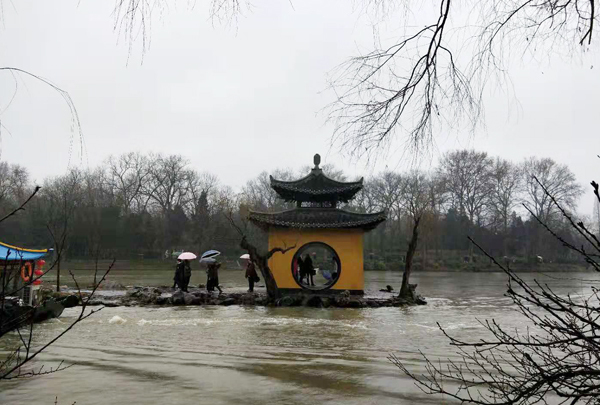 I was determined to make a visit to Daming Temple, next to Splendid West Lake. It was an essential point for my favorite series but I learned more than I expected. Jianzhen was once its Buddhist abbot. The memorial hall imitates the Toshodaiji Temple in Nara. In front of the hall, candle in stone lantern lights all year round, standing friendship between two countries. Ouyangxiu, the great poet, once lived there and admire the beautiful southern scene. At the left of the temple is built a memorial hall for him. 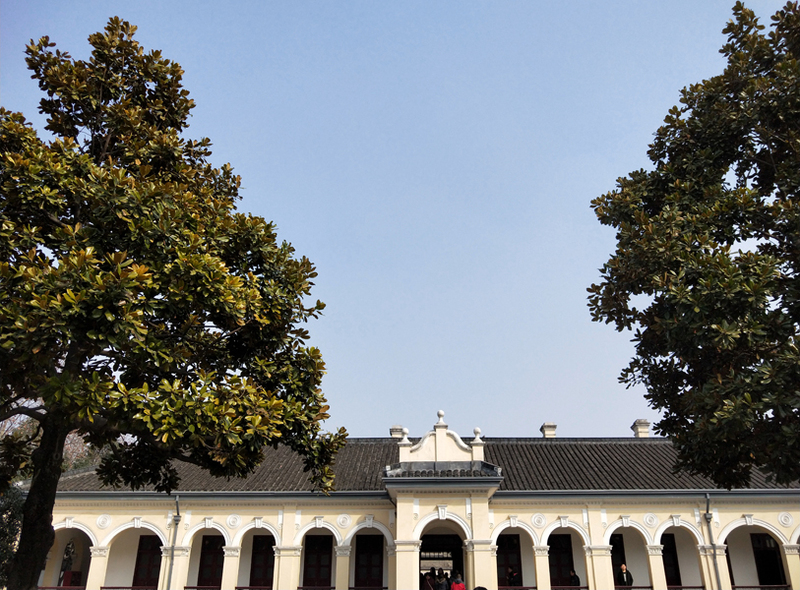 It is in a different style compared with Jianzhen Memorial Hall at the right wing. The last goal was fulfilled. Our tour finished. 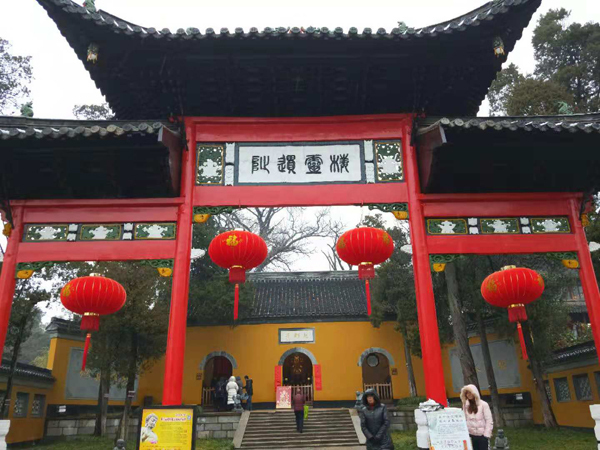 If you are interested in more tours about Nanjing, you can head to our Nanjing Tours with different experiences. 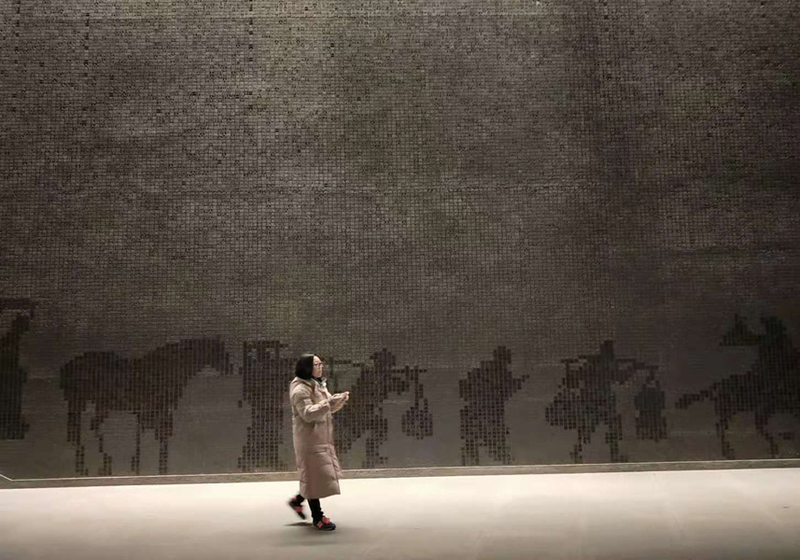 Feel free to select yours to explore the beauty of Jiangsu! 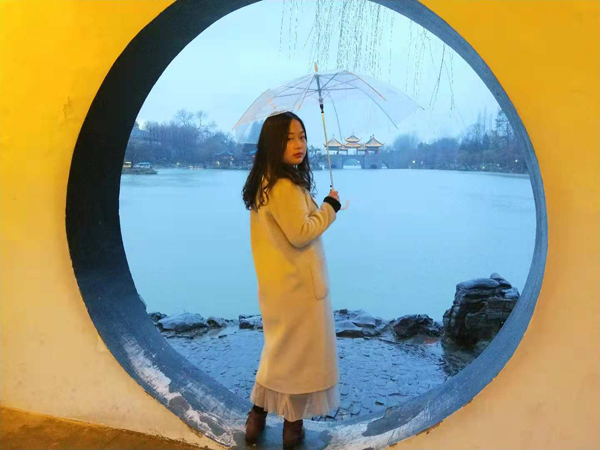 This entry was posted in China Attractions, china tour, travel experience, travel guide and tagged Nanjing Travel 2018, Nanjing Yangzhou Tour 2018 by Travel Expert. Bookmark the permalink.